How to start being healthy? There's two kinds of people concerning health: the extremely healthy ones -they workout, care about health and know how to eat clean, do yoga/stretching/meditation, they don’t drink alcohol, don't smoke...- and the ones who aren’t healthy at all -they don’t workout or very rarely, eat out almost every day and drink alcohol several times a week, don’t care how to eat healthy or don’t have much nutritional information...-. It’s a bit cliché but almost always true! I find rather rare the people who are in the middle, also because I noticed some people in the second category actually care for their health but don’t know where to start and are afraid to have to commit to very strict rules. I had a roommate who've always had a great metabolism all her teenage, therefore never cared much about how food would affect her size. And suddenly as she was in her 20s she wasn’t happy that she started gaining weight (nothing wrong about not being the fittest! If you’re happy and feel good that way it's perfect :) I'm just telling you about this one story). So what did she do? She went to buy “healthy food” that she doesn’t love as an effort to work on her health at the grocery store: roasted salted nuts and all made porridge with chocolate milk... see the problem? She ate foods that she didn't like because she thought she was making an effort but obviously, these foods aren't healthy or good to make you fit, so all she was doing was frustrating herself! We hear “nuts” and “porridge” are healthy, but if we don’t know why, we WILL make the wrong choices at the grocery store. It’s important to educate yourself when it comes to nutrition so you know you can actually have pleasure eating healthy (pizza’s aren’t that bad, even when they’re not cauliflower crusted, as long as you care about the toppings -you know cheese and meats aren’t the best- or how often you eat them) and that you don’t have to buy the so-called “diet” foods that you don’t really like AND aren’t working. Some people would say this is obvious but honestly, I see so many people that lack basic info on foods that I think it's important to help them know the basis -where to start- for a healthy life! Not everyone was born with parents who could teach them that ;). Coming back at the example of nuts: why are they healthy? They contain lots of good fats and extremely necessary nutrients (potassium, magnesium, vitamins, iron, calcium, ...) but the downside of it, is that they also contain so many calories (just a little less than oil, which is pure fat), which is great if you want to gain weight in a healthy way (I have many friends who are naturally very thin and try to gain weight eating a lot of fast foods and candies... Which doesn't work because they get sick of it, and it gives them poor skin condition most of the time). But if your goal is to lose weight, maybe you want to limit the nuts a little (don't completely erase them from your diet, remember the nutrients they have). As another example, fresh fruit juices are great and bring loads of vitamins quickly, but as I wrote in my article “juices vs smoothies”, you don’t have the fibers in it to help slow down the absorption of sugar... No problem at all if you don’t care (although it can mess with your blood sugar levels and so your energy) but again, if your goal is to lose a few pounds and that you think drinking juices will help you do that, maybe simply switch for fresh fruits or smoothies, where there are fibers to help fill fuller and slow the sugar absorption. There's no need to quit on natural sugar, it satisfies your sweet tooth and fruits aren't very high in calories, just be careful with the way you eat them :). So remember: people can be healthy without being skinny (so don’t judge too quickly), and depending if your goal is to simply improve your health, or lose or gain weight, there is not just one answer and you might want to make adjustments to your own diet. Instead of searching for “low fat”, “low sugar”, or removing all the carbs from your diet while still eating highly processed “diet foods”, you might want to go back to a simpler way of eating. Because your body needs nutrients and vitamins, and the more processed the less of these you have in it (maybe you've heard of the term "empty calories", which is when you eat something that doesn't bring anything necessary to your body). Always have fresh fruits and vegetables in your diet, and find ways to cook them that pleases you without wasting all the benefits (maybe try not to deep fry them every day haha). Also include basic plant-based foods in your diet that will help you feel full in a healthy way: rice, sweet potatoes, potatoes, beans, chickpea, lentils, ... These unprocessed foods should be your staples if you want to change your health, then of course, it's up to you to make it delicious in a way that is still good for you :), like chickpea curry with rice, lentil dahl with sweet potato, whole grain pasta with homemade tomato sauce, ... there are quite a few options to play with! Of course, not everyone has time to cook after a whole day working, so don't feel guilty about not being able to eat fresh produces every day. But for example take a look at the amount of sodium in a jar of pasta sauce you can buy at the supermarket: there’s often way too much salt, while if you simply make your own with simple ingredients (garlic, olive oil, tomatoes, onions, ... and a dash of salt and pepper) you’ll never reach that amount of salt. Sometimes it’s also a lot cheaper to make it yourself, and it doesn't take too much time in that case! So think about it when you buy all made foods: could you make it yourself? Is there ingredients in it that are unhealthy and you could avoid using if you made it yourself? When you do buy processed food -because there are good processed foods! Like oats for example, or canned beans- take a look at the label. Here are the few things to look for when you start your health journey (there’s more to look at, but these are the priorities in my opinion). There must be as little names you don’t understand as possible. You know, the scientific names you don’t really know what they mean? Well let’s try to stay away from them if you can. For example, I sometimes used canned chickpeas instead or dry ones because I'm in a rush, and when I read the ingredients on the can at wholefoods, some only had chickpeas, water and salt, while others had "calcium chloride" in it. So keep it as short as possible, if it's not necessary, I don't buy it :). If there is salt and/or sugar (note that most of the names finishing in “ose” have sugar - glucose, dextrose, fructose, ...) in the three first names on the ingredient list, it’s not a good sign (unless you're buying salt lol): the ingredients are classified by quantity, so the higher the name, the more percentage of it is in your product. I personally never buy any food that has added sugar in it, except if it's a particular cheat day (if I use ketchup for example). The reason is that I believe sugar is addictive (a few experiences proved it) and since I've quit added sugar I don't really crave it anymore. I also feel that natural sugars in fruits and dried fruits is way enough for my taste (since I've stopped eating added sugar, even from agave syrup and other health foods, I can taste it better, and some foods I used to love taste way too sweet for me now). Sodium: the problem with sodium is that it's often hiding in your everyday food (example: breakfast cereals) because it's a good preservative. Therefore, in general if you eat less processed foods you'll also reduce your intake of sodium, but if you want an indication of how much sodium is too much sodium for a food, here's what I found: it has to contain less than 140milligrams of sodium per serving (number from USDA's recommendations), or from 300mg to 120mg per 100g of food (120 is best obviously). Note that I don't count my grams and milligrams and all these numbers, as I say eating healthy shouldn't be complicated and if you simply reduce processed foods you should be ok :) but it's a good indication to start and understand. But don't panic, it's easy! It's important to indulge a little sometimes! If you’re unhappy with what you eat, are you really healthy? Mental health is also very important! It’s all about balance, remember you can't be perfect! As long as you’re making better choices everyday and that you’re informed about what you eat, you can of course drink wine with your friends and have a little fast-food sometimes, after all we only live once ;)! 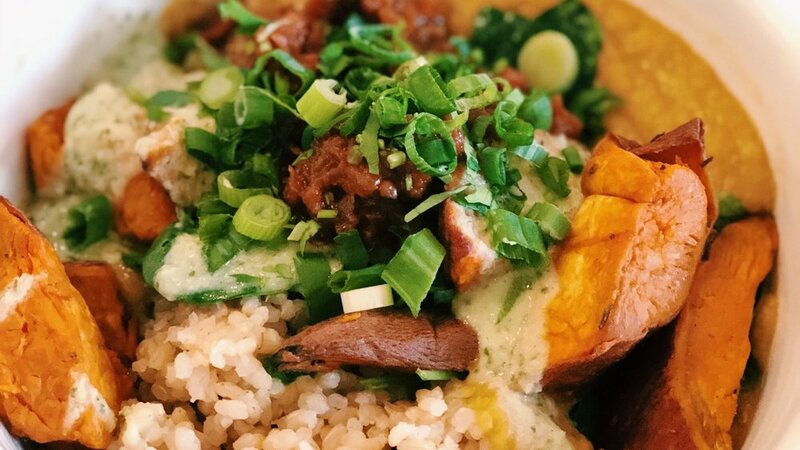 I talked about Backyard Bowls in my last post because it was my go-to place while I was staying in Santa Monica, but I wanted to add additional places where I enjoyed the food in LA. As I've been pretty busy (that explains also the lack of activity here), there may be "best-vegan-restaurants-in-LA" missing because these are the ones I got a chance to go to in between photo shoots and castings and they were all located close to my neighborhood, so don't hesitate to give me other names for next time. Also please note that except the first and last ones, the pictures in this article aren't from me because I didn't always take some when I ate at these places (whether it was because I was too busy enjoying the food and my friends' company or because the light wasn't good enough). I discovered this place thanks to my amazing roommate Samantha as she was mentioning to me her favorite places to order food in the neighborhood. She warned me "it's VERY healthy" haha, as we both know that sometimes the places we like are too healthy for our friends. The particularity about this place is that the waiters are asking you the question of the day that is about your dreams/happiness/feelings... -you don't have to answer- and each item on the menu has a positive affirmation (example "you are whole", "you are humble"). Some find it positive and warm, some find it cheesy. In that case, you can always order delivery ;)! If you like "VERY healthy" food and a "yogi" atmosphere, this place is for you. My favorites are the Macro Bowl and their Beer-Battered Young Coconut (tastes exactly like fried calamari, I was shocked). I also loved their November Pumpkin pie! And for their drinks, my favorite was the Grace smoothie (coconut based and verrrry creamy). Got a table full of messages during @brennamperkins' brunch. This one is for all those who think vegan eaters = healthy eaters! We actually eat junk food too, and it can be super tasty! Veggie Grill is the best vegan junk food place that I've tried yet and I'm torn between wanting them to open a restaurant in NYC because it would be great or wishing they never do because I would put on 10kg right away (nothing bad with gaining weight if you're happy guys ;), just that my personal goal is to stay fit)! I love that they use Beyond Burger from Beyond Meat for their hamburgers and that they aren't too expensive at all! My fave: the classic VG Beyond Burger! This one isn't an entire vegan place but they had such great quality vegetables that I had to put it here. 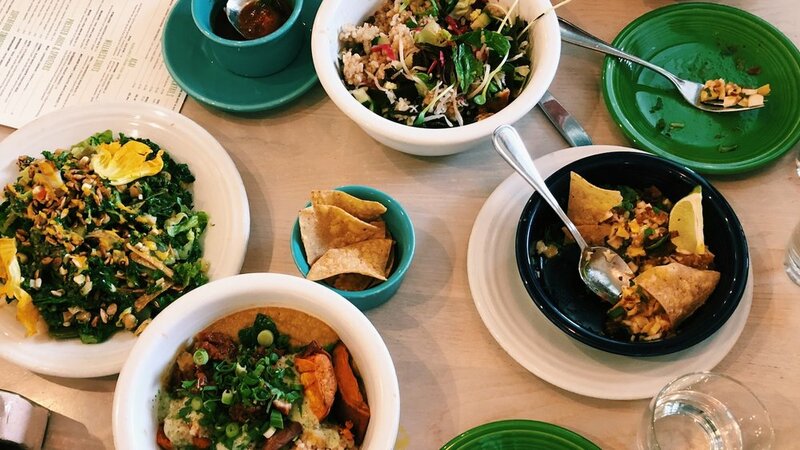 It's great to go with people who eat differently (healthy/less healthy, plant-based/not plant-based) because they have a great option for everything! I loved their Charred Cauliflower and their Ancient Grains Bowl! My friend who isn't vegan had one of their pizza and loved it! I would definitely go back often as you really feel the quality of the ingredients. Different people had messaged me about this restaurant but I only had one occasion to go with my friend Brian and l had a great experience. I ordered the Bollywood Bowl (have you noticed I love bowls?) and there were so many different flavors, the quantity was perfect (aka very filling haha, it was served with flatbread too). I also had one of their smoothies (don't remember which one, just that there were dates in it) and it was also so satisfying. I wish I could have been several times to test everything on their menu but I'll have to wait next time I come to LA :).